India finally suffered a series loss in their golden summer trip to the Southern Hemisphere after they lost the final T20I to New Zealand in Hamilton today. 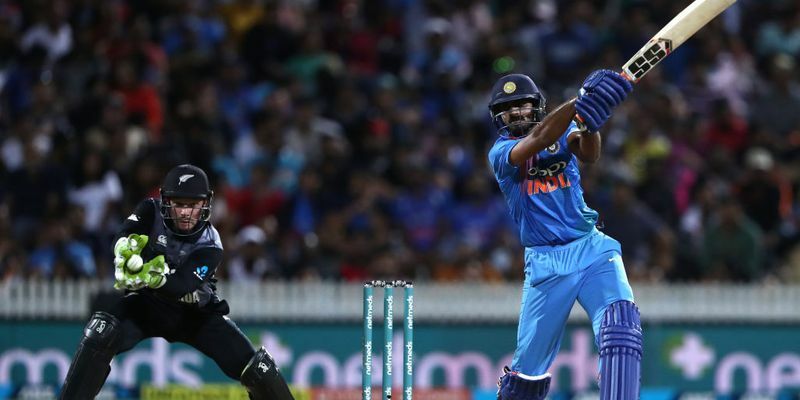 While Dinesh Karthik gave India hope, Vijay Shankar proved that he can be the perfect back-up all-rounder for the team in the World Cup. Rohit Sharma (4/10): A 32-ball 38 in a run-chase as big as 213, sorry, I wouldn’t give Rohit Sharma many marks here. He got a start and had a long batting line-up to follow, but the stand-in Indian skipper failed to make that count when he was dismissed in the 14th over. Could definitely have gone on and unleashed some of his sixes. Shikhar Dhawan (3/10): Another frustrating outing for the southpaw as he failed to counter Mitchell Santner from the word go and was dismissed in the very first over. The problem with Dhawan was he didn’t even try to give the left-armer at least an over time to understand the situation, rather he was worried to get off to a good start instantly. Vijay Shankar (8/10): The unassuming Tamil Nadu cricketer is turning to be a solid prospect for the Indian team and after today’s performance, one wouldn’t be surprised if he finds himself in the flight for the World Cup. His 43 runs was an exhibition of clean hitting and how to position himself perfectly before he found himself at a wrong position to slog Santner. Why he is not getting to bowl is beyond me, and that took a point off Rohit Sharma, who initailly got five. Rishabh Pant (7/10): A 12-ball 28 was a good score to have in a T20 game, but in the context of it, this seemed to have a little value. However, one might argue that with Dinesh Karthik, MS Dhoni, and Hardik Pandya to follow, he afforded himself the time to take a risk which is fair enough. Hardik Pandya (6/10): I am sure no one would say a single word to Hardik Pandya today even if he throws his stuff on people. It seemed like a collective effort to bring him down as three catches were dropped and fielding mess-ups in deep gave his bowling figure a torrid look. He tried to redeem himself with the bat, but the asking rate was too high which got onto him. MS Dhoni (5.5/10): Two runs off four balls. Thank the stars that the former Indian skipper didn’t play out the deliveries in the middle-over and was dismissed while trying a biggie. Leave that alone for a moment and think about the stumping to dismiss Tim Seifert. Man, that was awesome, which has also earned him the extra 0.5 in my book. Dinesh Karthik (5/10): The Tamil Nadu wicket-keeper’s innings was a classic example of why numbers don’t tell the full story. He batted with a strike rate of 206.25 in his innings of 33 runs took India close to pull off a miraculous win - almost giving the fans a hope of the repeat of the Nidahas Trophy final - but he denied a single to Krunal Pandya in the last over and failed to strike any big in the first four balls which meant the visitors were 5 runs behind of the win. Krunal Pandya (5.5/10): Superb. The senior Pandya is ticking all the boxes required to be an ideal T20I all-rounder and if there was any doubt about it, today he proved that he is very much capable of that. After having a tough day on the field, he didn’t bog down by that pressure and batted with purposeful fluidity. Nevermind, he failed to take India over the line, but he showed the prowess that India has until No.8. Kuldeep Yadav (8/10): He was the only saviour for the Indian team today, conceding runs at 6.50 while picking two wickets. While his normal leggies were coming out nicely, he confused the Kiwi batsmen with his wrong’ uns, and to deceive them, he bowled the slider regularly. While MS Dhoni got the credit for effecting the Seifert stumping, Kuldeep forced him to take the leg forward after landing in half volley. Bhuvneshwar Kumar (4/10): He was the only Indian pacer to have conceded below 10 runs per over, but that doesn’t make him a good performer. Despite a bit of sideways movement being available, the UP pacer was more interesting in bowling a good length and giving time to the batsmen to score just enough. Khaleel Ahmed (3/10): It is time that the Indian selectors need to end the Khaleel Ahmed experiment now and ask him to bowl well in the domestic cricket first. He didn’t have any idea of where to bowl and was taken to cleaners by the Kiwi batsmen. The less we talk about his fielding the better.